I set up my classroom in a large circle. Just chairs, no desks. Students read through the text on their own as a Do Now circling words that they might have difficulty with. Students share out these difficult words and they are added to a word bank. We agree together upon pronunciation. If you call this word bank “Scary Words” it means you also get to draw a ghost on the board (Hamlet. Ghost. Get it?) even if just for your own amusement. Students read through the text aloud going around the circle to “hard stops” (periods, exclamation points, question marks). There are twelve lines of text (if you include “Exeunt the Players”) and I have the students read through the text until every student has a chance to read one line. In my class with thirty students, we read through the Dumb Show three times. Check for understanding and questions. Are we able to define any of our problem words? Can we use them in our retell of the plot? What is going on? Students at this point are itching to get up out of their seats. I have done this lesson as the only teacher in the room, and I have done this lesson with six teachers in the room. When I was the lone teacher, I introduced the idea of the Tableaux Vivant to the class as a whole and did a quick demonstration before splitting them off into groups. With additional teachers, I had them each take a group, get the kids standing, and explain at this point about the Tableaux Vivant. Depending on your timing (and I stretched this lesson over two periods), divide the Dumb Show text amongst the groups so that each group has roughly the same amount of sentences. With my advanced group this year, each group did the entire 12 sentences of the Dumb Show. 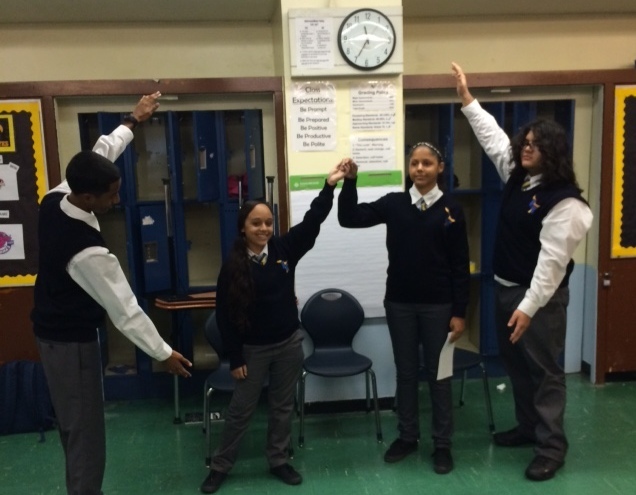 Have the students create a Tableaux Vivant for each sentence. Ask questions as the teacher to get students moving but try not to direct the pose. Start students in a straight line with their heads bent. Have one student step forward and read the line and then step back. Students should take a beat and then get into their pose. Have them practice holding the position for at least two beats. There is a question here about dividing students into parts. I find that parts really don’t matter as long as you don’t assign a “narrator” part. The purpose is to have all of the students moving and a narrator part usually means that a student will stand and read instead of becoming engaged. Bring the class back together. Have the Tableaux Vivants performed in order. Make sure you take pictures! As a nice way to end the class, explain to students that in some texts “Hautboys Play” introduces the Dumb Show text. The hautboy is a musical instrument like a modern day oboe that would have been played before the Dumb Show started. Of course, this word sounds very different in modern English (Hot Boys!). Have all students hold a “Hautboys” pose for a big, laughing, class photo at the end of the day. In the future, I might call this activity Instagr(H)am-let and try to capitalize on the students’ already deep understanding of the effectiveness of poses on an audience to deliver message and meaning. Perhaps we’ll even coin our own hashtags and make #dumbshow a trending tag. Maybe the trend will catch on and become a movement and suddenly we will have thousands of teachers ditching their syllabi on the first day in favor of movement. But for today, as we all took our final poses for a classroom picture, the smiles needed no hashtags. Shakespeare is fun. This class is fun. This year will be fun. David A. Fulco is a New York City high school English teacher at The Laboratory School of Finance and Technology in the South Bronx (MS/HS223). He is an alumnus of TSI 2014. Follow him on Twitter @FulcoTeaches. Instagr(H)am-let is my new favorite pun, and I can’t wait to try something like this next semester!